Weekends have once more become full-on gardening weekends. Preparing the garden for spring has become a race against time. With hedges, fruit trees, roses and herbs pruned, the feeding and composting has begun in earnest. The lawn is enjoying a reprieve from being mowed and is rapidly taking on the feel of a meadow. 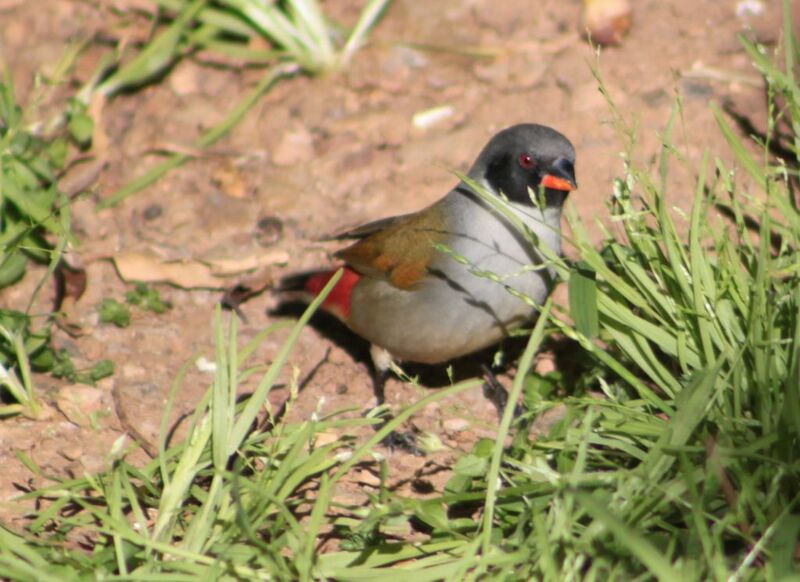 With yellow dandelions lurking in the lawn and winter grass going to seed, it is a scenario all to the delight of the tiny flock of Swee Waxbills that have made the garden their home over the last two years. I am glad someone is enjoying the uncut lawn, as we rush about between digging over the gardens, planting out onion seedlings, feeding and watering the fruit trees. Watering the orchard manually, forces me to slow down. 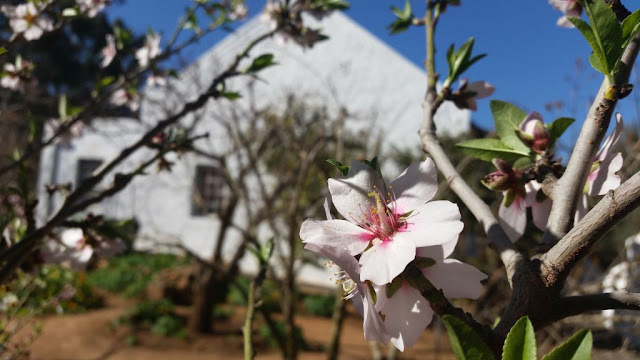 There is the spectacle of nasturtiums on the orchard floor and a variety of peach, plum and almond blossoms against the blue sky, to be enjoyed. The nasturtium seeds were in the soil that we re-cycled to make the new dams around the fruit trees. The seeds have exploded in a feast of yellows and oranges on the orchard floor, spreading between the dams and reminiscent of the nasturtiums of Monet’s garden at Giverny. 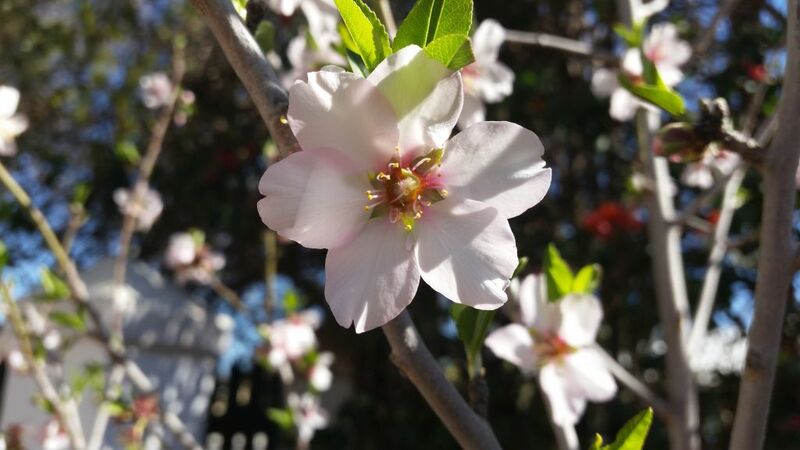 The blossoms range from plum white, to faded peach almond and peach pink. They are vibrant against the clear blue winter sky. 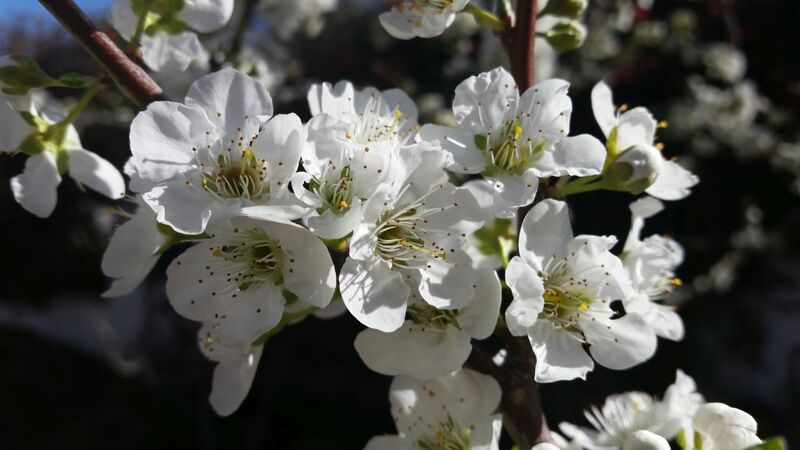 Each tree with its own distinctive fragrance proclaims that spring is in the air. With the bees flying from blossom to blossom, I could observe which blossoms they prefer. 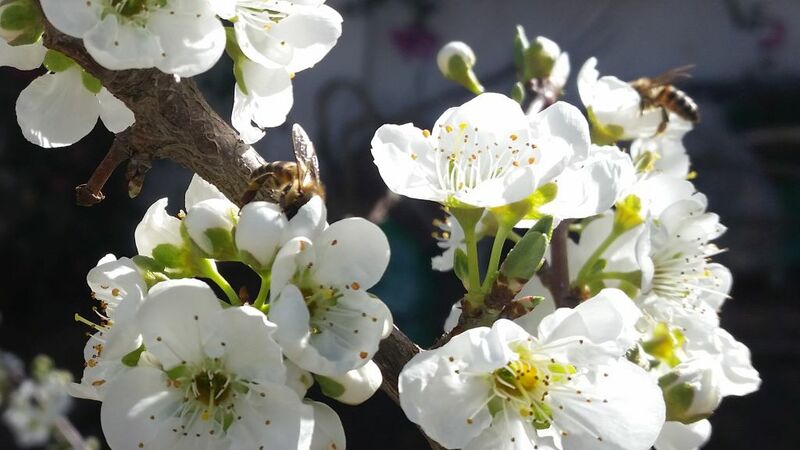 Some even trying to get to the pollen in the closed blossom buds as well. 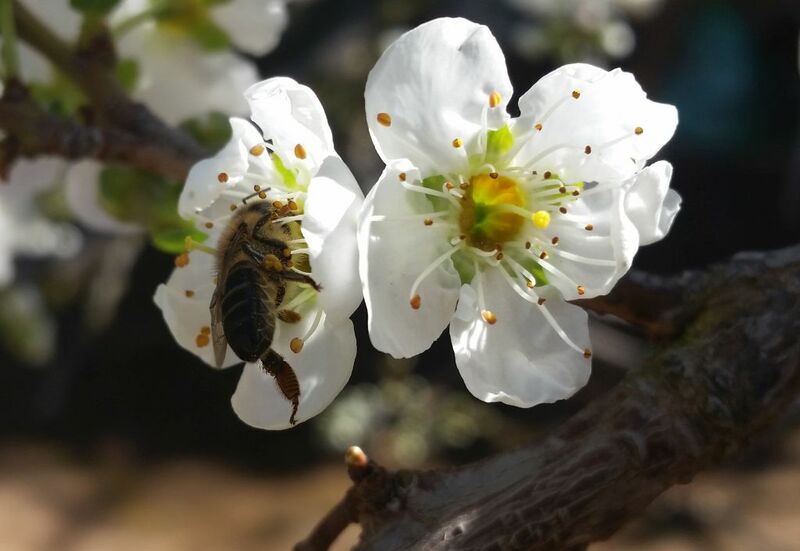 I am quite surprised by the number of bees still visiting our orchard at a time when the entire valley is a feast of blossoming orchards. 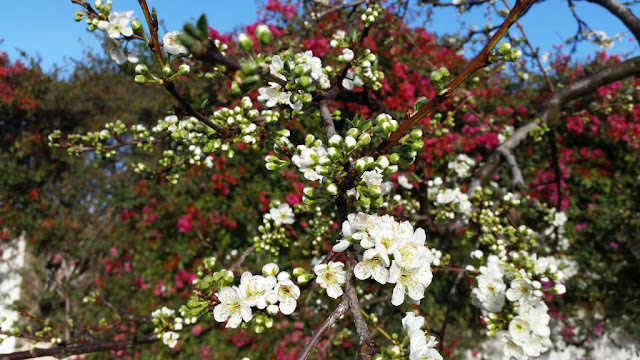 Perhaps it is less crowded and the assortment of blossoms in close proximity, more appealing. With the blossoms comes new life. 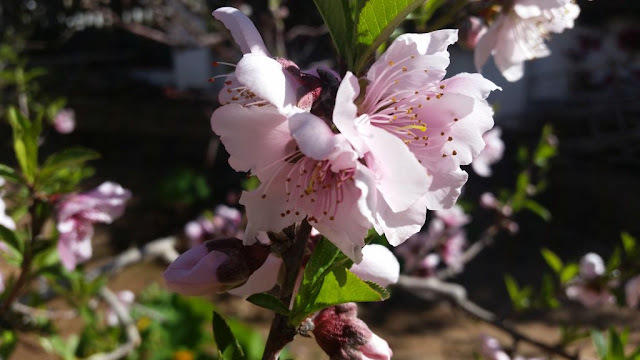 Some peach trees are showing their tiny buds of fruit. Many an artist portrays new life and youth with blossoms, while others use it to reflect a nostalgia for a fading rural past. 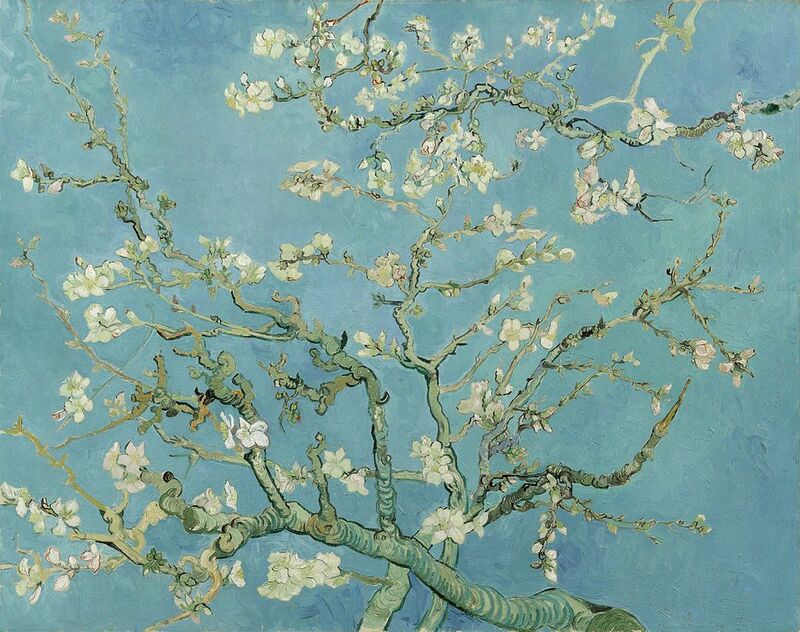 It was in 1888, in Provence, that Vincent van Gogh began his most productive period of his painting career. It is said that the blossoming apricot, peach and plum trees inspired him. 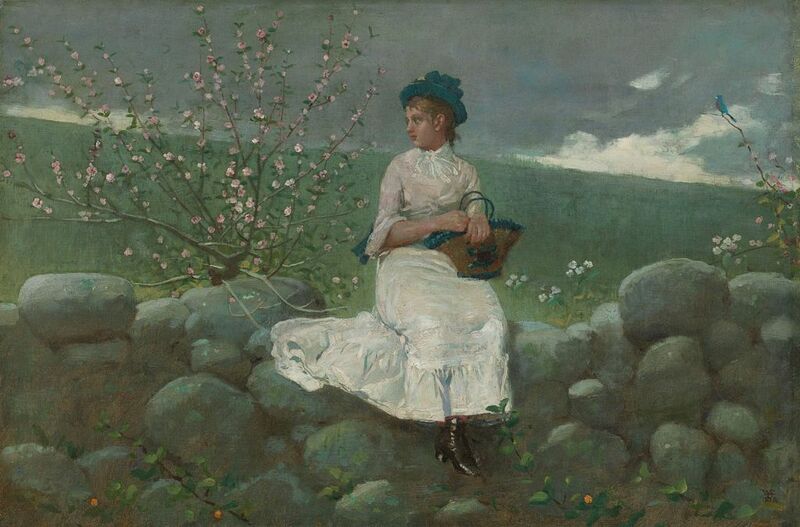 And, in this time he nearly completed one painting each day on the subject matter. I completely understand how he must have felt. 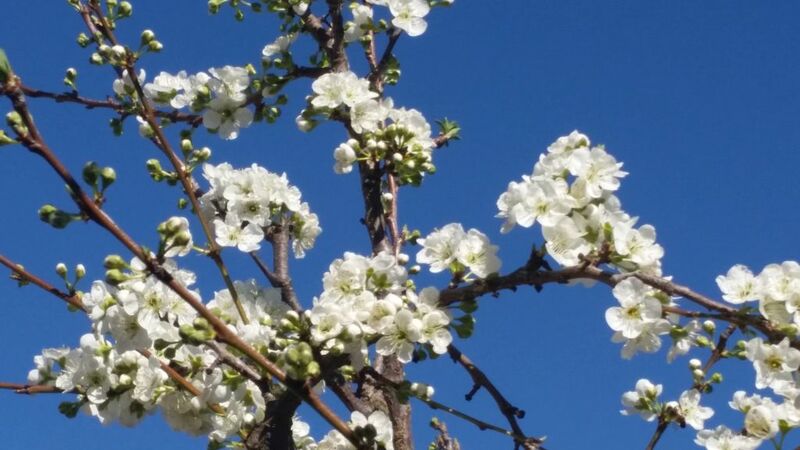 I too am excited by our small orchard in blossom, what to say of the larger orchards of Provence. On the 31st of January 1890, Theo wrote to Vincent to announce the birth of his son, Vincent Willem van Gogh. 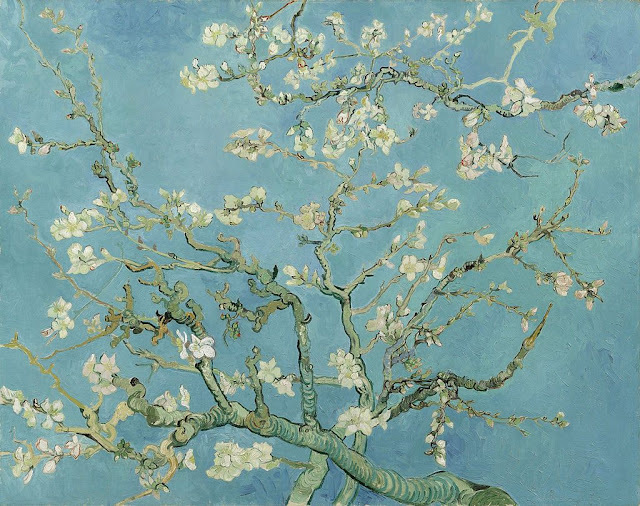 To celebrate his nephew’s birth, Vincent started a painting of almond blossoms for Theo and his wife. 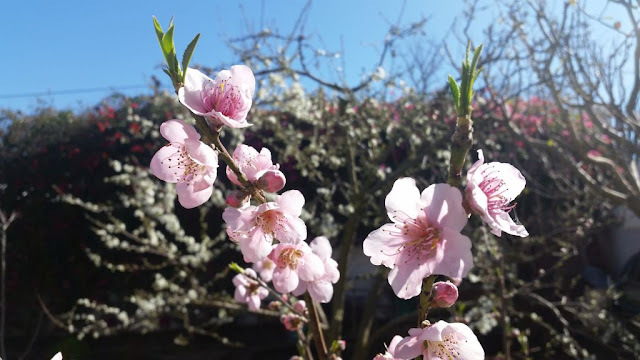 The almond blossoms symbolising new life for the birth of the baby Vincent. 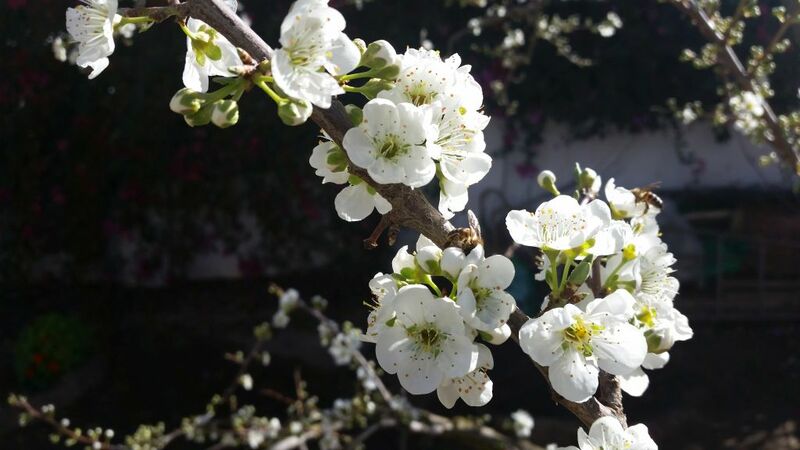 The blossoms remind me of so many orchards of my youth. It evokes a nostalgia for an uncomplicated time. I wonder what Homer would have thought about our rapidly changing rural landscape. On a clear winter’s day, I enjoyed the luxury of standing in our orchard with water rushing into the dams of the fruit trees. I could watch how the activities of the bees made the silk like petals drop to the orchard floor to form festive polka dot patterns in their abundance. Lovely post. The art references are fascinating, as are the activities of the natural inhabitants of the garden. Interesting observations, thanks.